About "10th grade math solution exercise 5.4 part8"
Find the equation of the line passing through (22, -6) and having intercept on x-axis exceeds the intercept on y-axis by 5. If A (3, 6) and C (-1, 2) are two vertices of a rhombus ABCD, then find the equation of straight line that lies along the diagonal BD. In any rhombus diagonals bisect each other at right angle. In any rhombus midpoint of the diagonals will be equal. 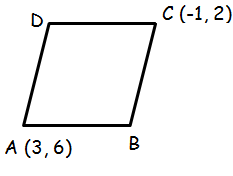 (1, 4) is a point lies of the diagonal BD. Hence the required equation is x + y - 5 = 0. Find the equation of the line whose gradient is 3/2 and which passes through P, where P divides the line segment joining A(-2, 6) and B (3, -4) in the ratio 2 : 3 internally. First we need to find the point P.
Hence the required equation is 3x - 2y + 4 = 0. After having gone through the stuff given above, we hope that the students would have understood "10th grade math solution exercise 5.4 part8".